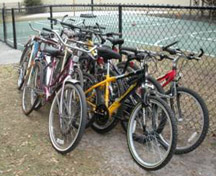 On February 21, 2010, 11 bicycles were loaded into a container at Wellspring United Methodist Church to go directly to Haiti with a full load of food, clothing, and blankets. Initially, it was thought there would not be enough room for any bikes in this shipment. When room was found, the dash was on to get them to the container. Within the same week, we connected with Magical Charters in Odessa. Magical Charters runs bus tours and was collecting supplies to go to Haiti. 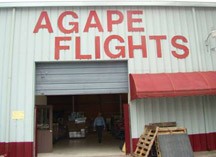 They work with Agape Ministries in Venice, FL, affiliated with the Agape Ministry in Haiti.Bicycles on Magical Charters In order to facilitate shipment of donated materials, it is essential to have a source on the ground to take responsibility for the items shipped over there. Kassie Newman from Magical Charters reported that aid workers were dancing in the streets when they heard they were getting these bicycles because transport is very limited. Agape Ministries has asked for 26 more bicycles. 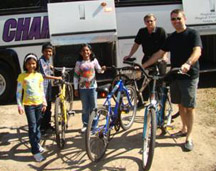 In that same month, the Bicycle Ministry refurbished 21 adult bikes and sent them on to Haiti. 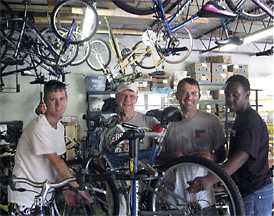 Bicycle ministry helps repair lives in Haiti, at home. Before the Jan. 12, 2010 earthquake in Haiti, the Rev. Guerry Lefranc called 56 orphaned children “my kids.” Now, he says, he could easily be father to 200 if he had the resources to care for them.